"A Southeast Asian chopped salad bursting with exotic flavors. Sweet yet tart. My boyfriend was surprised when I duplicated this salad after we raved about it at a popular restaurant in San Francisco. Enjoy." Bring a small pot of water to boil. Cook shrimp in boiling water until they are bright pink on the outside and the meat is no longer transparent in the center, 3 to 5 minutes; drain. Rinse shrimp with cold water to cool completely. Peel, devein, and slice shrimp in half lengthwise; set aside in a bowl. Toss apple, jicama, and carrots together in a large bowl. Place mint leaves, olive oil, sugar, vinegar, Dijon mustard, garlic, and lemongrass in a food processor. Pulse until blended but slightly chunky, about two 10-second intervals. Pour dressing over apple mixture; toss until well mixed. Cover salad and shrimp separately with plastic wrap; refrigerate until ready to serve. 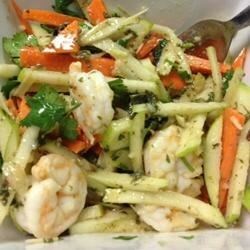 Mix shrimp into salad before serving; garnish with cilantro. This was very good. Interesting and different. I make this around once a month. I've never had a guest who didn't like it!